This one day course will provide you with a fundamental understanding of the elements of Passive House design, which leads to cost effective, low energy buildings with increased occupant comfort and reduced mechanical systems. Participants must be homeowners in RDN Electoral Areas. Sessions must be scheduled before December 31, 2015. At least 5 attendees (besides the homeowners) must be present during the coaching session. Free assessments are limited and will be provided on a first come first served basis until funds run out. If you are interested in being a host, please email sustainability@rdn.bc.ca or call 250-390-6510. This house showcases what improvement can be done to an ordinary home built in 1980s to reduce its energy use and carbon footprint. The owners show their commitment to a sustainable lifestyle by driving an all-electric car, two electric bicycles, installing an electric charging station at home, adding a 5.7 kW solar system (22 panels) on the roof to generate electricity on site and keeping a thriving garden for food production. The fuel cost for the electric car is about $2/100km. The solar system produced 4.5 MWh of electricity during the first 7 months (January through July). Expected savings on utility cost is projected to be about $700 per year. Come visit the house and talk to the owners to find out what might apply to your house! Designed by the owner, this newly constructed two-story home comprises a 2,000 sf level entry rancher above a separately accessible walk-out basement. It features not only a stunning view but also a range of sustainable features. It was constructed with Styrofoam formwork blocks that provide R50 thermal insulation and excellent sound proofing. This home has a metal roof collecting rainwater to an 18,500 gallon in-ground water cistern and a triple level particulate filtration and ultra-violet light purification system. The rainwater harvesting system supplies both potable and non-potable water to the household. A 2.86 kW grid-tied solar photovoltaic system was installed to generate clean and renewable electricity on site. Its passive design features include high-level south-facing windows that provide excellent light and warmth during the winter months and ventilation during the summer, while the roof overhang excludes heat gain at the height of summer. Heating and cooling is provided by a variable volume air-to-air heat exchanger for the upper floor and simple baseboard heating for the basement in anticipation of infra-red radiant heating panels to be installed in the future. LED lights, water and energy efficient applicants are used throughout. Thinking about building a new house in the near future? Come to this open house for a close-up look at all the features. 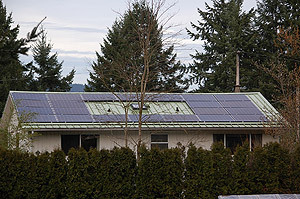 Viridian Energy Co-Operative will give a presentation on solar power system. 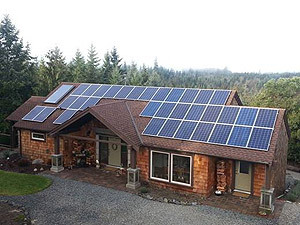 As the cost of solar photovoltaic systems drops significantly in the last 5 years, homeowners are increasingly interested in incorporating solar power to their energy systems at home. This presentation will cover topics such as why site potential analysis is important, what a basic system looks like, how to monitor its energy production, why it can be a good investment, and how BC Hydro net metering program works. 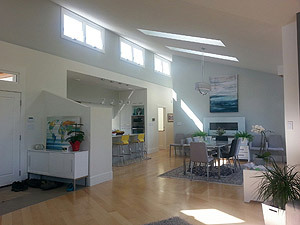 This new house underwent a comprehensive energy retrofit shortly after the owners moved in. A solar hot water system was added to supply pre-heated water to supplement hot water demand. An 8.58 kW solar system (33 panels) was installed to help meet electricity demand. More recently, the owners installed a 1,950 gallon cistern and three 400-litre rain barrels to collect rain water for a vegetable garden. The house is also artistically and thoughtfully fitted out with reusable and natural materials that are repurposed as decorations or functional items ranging from cabinet handles to furniture pieces. Come to discover how to transform a conventional new house into a cozy, efficient and appealing home. 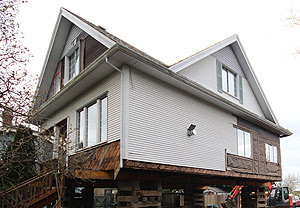 This stately heritage home in downtown Nanaimo is undergoing a complete structural upgrade and a deep energy retrofit. The work includes raising the house to remove the failing foundation (as pictured) and pouring a new insulated concrete form foundation, removing walls on the main floor for an open floor plan and a completely new roof structure. The result will be a stunning, traditionally styled space with all the modern amenities and comfort of a brand new, high-performance home while keeping the charming heritage look and feel the property has always brought to the surrounding neighbourhood. The project will be partially completed at the time of the tour. Interested in learning about the challenges and opportunities of a heritage home renovation? Gain valuable insights and see the energy improvements before they are hidden behind the finishes.